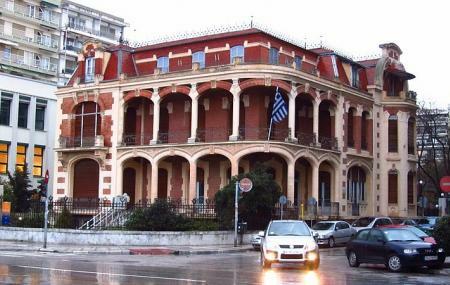 Find hotel near Ethnological Museum Of Th ..
Ethnological Museum Alexandroupoli is a well-known Museum that works on promoting and preserving the authenticity; the self-expression of ethnic groups who made the area their home. Since the year 1899, The Museum has been operating in a stone-built and leased neoclassical building which dates from 1899. It was opened up to the public in the year 2002 and is basically a living cell where you would be able to know more about the customs and folk culture of Thrace. Ethnological Museum Alexandroupoli connects the memory contained within it and the traditions with the contemporary society. There are over 500 objects in its collection and comprises of objects, archives with pictures and documents, videos, recording, and the library. How popular is Ethnological Museum Of Thrace? People normally club together Papazoglou, Chr., & Co. O.e. and ΘρακηΝετ while planning their visit to Ethnological Museum Of Thrace. If you are in Alexandroupolis this is a must see. Well displayed artifacts, knowledgeable and helpful people. Thanks for keeping it up! Great work. Sensitive and moving. Don't miss the basement exhibits! Amazing small museum a "must" visit in Alexandroupolis!